Kathmandu’s poor air quality has become so serious that with the onset of winter there is growing public outrage about its health implications. Findings released this week by the Energy Policy Institute at the University of Chicago add further proof that air pollution is emerging as the world’s single largest environmental health threat – and Asian countries are most at risk. The study has mapped air pollution data to show where it is worst. Deteriorating air quality in Kathmandu Valley due to suspended roadside dust particles, vehicle emission, brick kiln soot and transboundary pollution from India is shortening the average lifespan of people here by up to four years. Pollution levels in Kathmandu are sometimes worse than in cities in China and India. The findings were published in the Proceedings of the National Academy of Sciences last month based on an analysis of pollution data from 154 Chinese cities from 1982-2012 compared with mortality data covering 78 million people from 2004-2012. Researchers found a strong correlation and concluded that life expectancy is reduced by about seven months and one year with every additional 10µg/m³ of partciles that are 10 and 2.5 microns diameter respectively. The results greatly strengthen the case that long-term exposure to particulate air pollution causes substantial reductions in life expectancy,” said Michael Greenstone, an author of the paper and director of the Energy Policy Institute (EPIC) at the University of Chicago. Researchers studied China’s Huai River Policy, which has provided free coal for indoor heating during winter months for residents in cities north of the Huai River since the 1950s. They found the policy lead to an increase in cardio-respiratory diseases that have decreased life expectancy in Beijing by 3.1 years, compared to cities to the south. The policy contributed to the increase of particulate matter concentration over time, with PM10 concentrations five times higher that the World Health Organisation (WHO) safe limit (20µg/m³). China is now engaged in an aggressive policy to reduce air pollution. It is switching to electric vehciles and changing its main source of heating from sulfur-rich coal to gas-fired boilers and electric units. It has shut down polluting thermal powerplants near cities. As a result, the concentration of 2.5 micron particles in Beijing and other cities has decreased, and it is expected this will now improve average lifespans. India has 13 of the world's 20 most-polluted cities, and despite efforts the problem appears to be getting worse every year. The crisis is compunded in winter when water vapour condenses on suspended particles leading to thick smog over the Indo-Gangetic plains, which in turn increases the burden of seasonal lung ailments. The researchers also developed the Air Quality-life Index (AQLI), a tool that will allow people in different countries to learn how much longer they could live if the air pollution was reduced to meet WHO or national standards for smaller and more harmful PM2.5 particles. 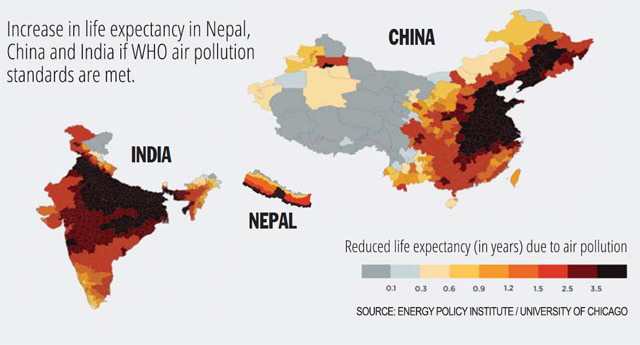 In Nepal, people in the Tarai, Kathmandu and Chitwan on average lose four years of life to pollution (see map). Rising PM2.5 levels have shortened lifespans of South Asians. In Bangladesh, where PM2.5 concentration is often above 60µg/m³, people could live 5.16 years longer if air quality met the WHO standard, while Pakistanis live 2.49 years less than their average lifespan because of air pollution. In 2012 in Nepal alone, 315,230 'person years' were lost to people getting sick from ambient air pollution. Despite all the bad news, Nepal has shown considerable progress in the past 12 years. We review some of the little-known success stories. Mr Vajapayee does not want war. Nor does General Musharraf. But do they know just what is at stake here? Maiti Nepal is getting ready to move into brand-new premises, with a little help from German friends. The pundits of this region harp on about the economic sense of getting together, ignoring the political sense that requires.